As an entrepreneur, you’ll know it’s not always easy to take a break from work (especially when work keeps getting in the way!). But we all know how it feels. The good news? More and more people are realizing how important it is to make time for themselves. One of the best ways to do this is through exercise. So you won’t be surprised that we regularly come across amazing Jimdo websites, made by users who are doing great things in the yoga, fitness, and health areas. And what better way to reach clients than by creating your own fitness site where you can share info about your classes, get bookings, promote your latest special offers, and rank in the local search results? Check out all the different and creative ways these yoga studios and personal trainers are doing it with their own websites. Yoga instructor Petra captivates her website visitors at first glance with a beautiful video background. We love the slow sequence of images and enchanting, atmospheric shots. Her idea of guiding visitors directly to her “About Me” section or class timetable, via two buttons on the start page is well thought out. New visitors can find more detailed information without any detours or if you’re already a client, you can just skip to the class times. Another small but effective detail is the “readable” URL that includes the city or region (“Kremstal”) where she’s based. This is a great way to target new and local customers! You may already have read Jenny’s story on our blog (if not, check it out!). Jenny’s mission as a yoga teacher is to give her clients time and space to let go and refuel. 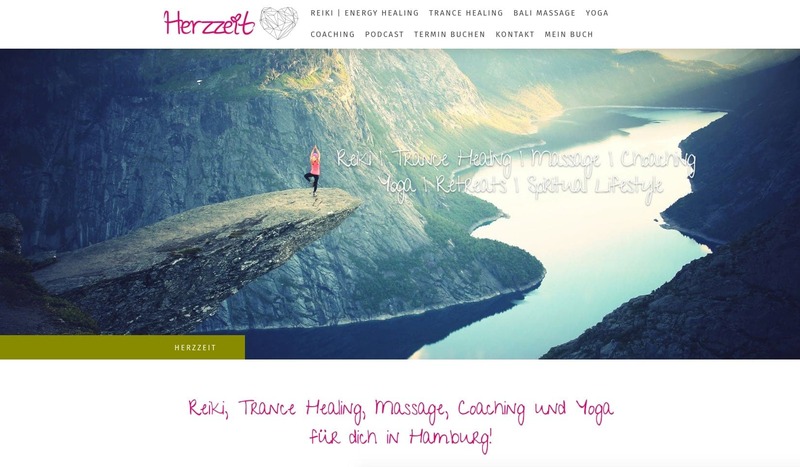 On her website, she describes the classes she offers ( Reiki, massage, trance healing) in clear and easy-to-understand language that hooks new customers straight away. She also offers her website visitors more ways to get involved—with a direct link to her popular “Herzzeit” podcast and an option to order her book online. Fayo is a practice that helps with movement, relaxation and pain therapy. On Ruth’s website, visitors can benefit from her expertise as a sports teacher and therapist to learn all about the concept, get to know the team, find the location and contact the center. Visitors can find all the information they need straight away without clicking through lots of pages or reading long texts. A real-life example of why a simple, concise website can often be the right choice. Wiebke is a fitness instructor that organizes boot camps “just for girls.” And when you land on her homepage, this sporty shot of a determined runner at dusk will motivate you to get started right away! She’s used her memorable logo to inspire the color theme across her site and added subtle CTA buttons in all the right places. By doing this, she’s made it easy for visitors to register for her courses and convert into customers. And if that wasn’t enough to get you up and running, check out the direct tone and active voice she’s used in her text! We love it. Your philosophy, your offer, opening hours, etc. are relevant but try not to overload your visitors with too much information. This is particularly important for background and header images. Start with professional, high-quality images that fit your project. Short sentences, simple phrasing, and an authentic tone of voice will make your content easy for visitors to understand. A well-placed button will take your visitors exactly where you want them to go, whether that’s to your contact form, online shop or your booking page. A button in your navigation, for example, could increase your conversion rate by making it easy for customers to call you with a tap. Do you have a fitness or yoga website? We hope our examples have inspired you and given you new ideas for your own website.